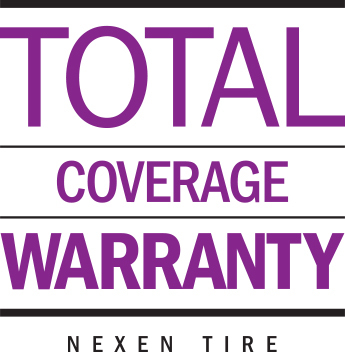 * Most, but not all Nexen Tire patterns come with a Treadwear Mileage Warranty and/or Road Hazard Warranty. Check each pattern for coverage. Covers your tires for the stated warranty period against premature wear and credits you back for the miles that were under delivered. Covers your tires for the stated warranty period for the replacement cost of a new tire in case of non-repairable damage caused by road hazards such as nails, glass, potholes or other debris. Covers your tires 24/7/365 for a period of 36 months from date of purchase. In case of flat tire, a qualified professional will change your flat tire with your spare tire free of charge. If a working spare is not available or you have two or more flat tires, towing will be provided free of charge to the nearest Nexen Tire dealer or authorized place of repair.